A Line Array is a special type of loudspeaker system, made for throwing concert audio over longer distances than was previously available using conventional loudspeakers. Line Arrays are typically used for larger live events covering thousands of people at a time. A rental Line Array is typically flown or rigged from the ceiling in an indoor venue or from the rooftop structure in outdoor environments. Because of the way rental Line Arrays are hung, it's important to choose a production vendor that understands the specific needs that Line Arrays have. At In Depth Events, our audio technicians are experts at hanging and operating rental Line Arrays in a variety of environments and applications. We've provided rental Line Arrays for concerts, festivals and live music events of every type, as well as indoor events such as corporate meetings, corporate parties and family events. Our onsite professionals have the experience you need to make sure your rental Line Array sounds great, covers the crowd properly and is flown safely. Also, our trucking and logistics department will get your rental Line Array to your event site - hassle free! Should I choose an array or a conventional audio system? Every event is different and it's important to note that rental Line Arrays are not the best solution for every show. Because of rigging requirements, audience size and type and a list of acoustical reasons, a conventional sound system rental may be best for your specific event needs. You are welcome to call us with your specific events needs and talk to one of our event professionals for more information on what audio system is best for your specific event. 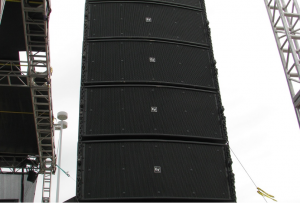 For more information on our Line Array rental services, please Ask Us a Question. You'll find that our friendly event specialists can provide quotes for even the most demanding audio requirements. We look forward to hearing from you, and working with you!